When a company wants to create a good work environment based on trust, good customer service, collaborative teamwork, excellence and fine problem solving, it starts to search for methods that are responsive. To be honest, in today’s generation, there are plenty of approaches and methods that can change employees and help them become more committed productive and creative. Therefore, if we speak of top quality management, we must have both employee involvement and empowerment. 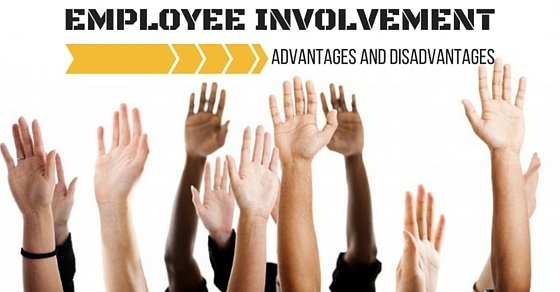 However in this post, we are going to focus on employee involvement exclusively. Keep reading to find out what it really means, what its advantages and disadvantages are and how you can use this approach at your workplace today. What is meant by Employee Involvement? Before you learn about the advantages and disadvantages of employee involvement, you must also learn about it as a concept. Employee involvement basically means to create an environment where people tend to have an impact on the actions as well as the decisions that are about to affect their jobs. Employee involvement cannot be looked upon as a goal or some kind of tool. Instead, it is a philosophy of management and leadership that most people use to become more capable since only that can improve the working environment and help the company reach great heights. Involvement not just boosts commitment and ownership but also helps you to retain the best of your employees and fosters a good environment where people can stay motivated. The good part about employee involvement is that the employees will begin to feel like they are a part of a team. It will make them feel valued. When most associates are involved in the same perception of decision making, it will help them see each other as capable. They will soon have their own management and ownership positions at work, show more commitment and effort which will help the company reach great heights of success. The associates happen to make much better day to day decisions since they have proper information about the company and its current issues. When people sit together and work on something, it is quite obvious that the decisions will be much better. In fact, there will be new and creative ideas floating all the time at your workplace. And that is what we all want at the end of the day, don’t we? To keep things short, we can say that employee participation is a great way to get more people involved so that the decisions made in the process are better. The associates will also feel a much bigger and stronger sense of responsibility when it comes to making decisions. When you become responsible for making a decision and that decision turns out to be a horrible one, you do whatever is possible to make corrections and turn things right as quickly as possible. The same is actually quite true for others. When associates have been involved in making such decisions, the chances will increase the chances of success since most members belonging to the team have been committed to correcting the parts of such decisions that are not aligned with the vision and values of the company. When there is energy participation inside the company, there are chances that the problems shall be focused on more. There will be changes made in the management and solutions shall be found in the current problems the market is facing. Associates who aren’t involved in decision making shall also help and give away some really great comments that will help the company grow. When there are more employees, there is a bigger chance of seeing creative solutions to problems since there are so many people with so many differing ideas. Also, when the team focuses on all problems at one go, the solution is very quick and easy to find. Don’t you think so? With employee involvement, the motivation and morale are much higher in most organizations since the associates will be involved in the decision-making of the company. When people have been involved the process of decision making, they will know how to make a difference in the success of the company or its department. When people know how they can make a difference, they will also find it easy to feel more motivated and even more satisfied at work. A journal published by management study guide once said that security risks can increase if there are more people in the workplace. This typically means that sharing valuable information and data with a larger chunk of employees could become a huge risk. There is some information which is needed to make important decisions and we understand if you want to give that away but always remember that data that is of sensitive nature shouldn’t be passed on so easily since it comes with a threat. Another sad disadvantage of participative management is that most employees shall have a much tougher time when it comes to recognizing the difference between employee and management levels. When you are removing the fine barrier between employees and management and the employee is still an essential purpose of such management, the company still must have properly designated leaders so that they can avoid the need for uncertainty or chaos of command when they are difficult situations enter our lives. How to Increase Employee Involvement for a Better Workplace? A great thing you can do to make your workplace even better is by keeping them updated. Those employees who have felt positive regarding their jobs will offer you enthusiasm, support or brain power. Your staff will feel engaged when you work transparently and keep them aware of what is really happening at work. Your staff will let you know of the financial situation in your company, whenever you land a big contract and how the work will contribute towards the success of your own business. Being a small owner of a business, it does pay to have a culture that is transparent which can help you expand and grow. The biggest reason why most people go to work is because they want to earn some good money. Still there are most people who are searching for some sort of fulfillment in their work area. Employees who are empowered shall tap into the talent and help you solve problems in a much better and simpler way. Give your employees when you have the power and freedom to follow up with the decisions and micromanage them at the same time. This will allow you improve the attitude of your employees and help their jobs. It shall also free you up to do several tasks that are on your plate. Employees who are able to plan their work schedules happen to be more engaged when it comes to the result part. You should allow your workers to have their own schedules as well as deadlines depending on the goals that you have already shared with them. Also, give the employees some freedom and flexibility so that they are able to work out and handle their schedules as well as family responsibilities. Create a result oriented workplace since you don’t really have to be answerable to some corporate company or hierarchy. When you have flexible schedules, it could be a great way to improve the retention which means that you won’t have to spend enough resources and time which are always training their fresh employees. Employees have become far more involved and successful nowadays because of how much they are being rewarded. People who are getting a fair wage should be paid more with some incentives that will increase the business and make it even better. This will also show the employees that you care and appreciate them and do recognize the involvement they have in your company. It will motivate your workers and staff and also help them become creative and productive. This brings the post to an end. If you have enjoyed reading the article and have understood the topic thoroughly, make sure to discuss this with your colleagues before it is introduced inside your office. Also, if you have a few comments to give or a few ideas to share, you may let us know in the box given below. Plus if you have questions and doubts you would like to clarify with us, let us know that as well. We would love to handle all doubts and queries. On that note, good luck!